So as the mud started to crack, flop went the recording industry into the next puddle, which in retrospect looks like an episode from TV's The Good Life. The record companies attempted self-sufficiency while their bemused technology neighbours looked over the fence. So, in 2001 Universal was ready to announce Duet, its exclusive licensing partnership with Sony, to push its own aforementioned bluematter file format on as many unfortunate retailers as it could corral. And shortly after, RealNetworks put together a consortium of the other major labels and announced MusicNet, to do much the same. 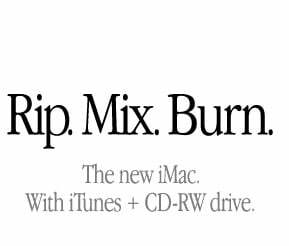 Here's the counteraction: 2001 was the year of Apple's 'Rip. Mix. Burn.' campaign, as it added a CD-RW drive to the already iconic iMac home computer. The labels whinged, of course, and while 'fair use' got its first real public airing in the press, the hipper recording execs started talking about downloading CDs to your computer and ripping the files to your MP3 player. Language is a window on the soul sometimes. The public was so excited by their new freedom with music, that when Apple launched the iPod the brand name was immediately genericised, like the hoover and fridge before it. And recording execs - now looking slightly less hip - started pointedly referring to 'MP3 players': meaning any device which could decrypt Windows Media DRM. It took just over a year for RealNetworks to realise that record companies were - to bring the Good Life analogy to a climax - unable to recognise a goat, let alone milk one or turn it into curry pasties, hopping back over the fence to rejoin the technologists and announcing that the future was in its own subscription service, Rhapsody. Spotting another muddy puddle, the record strategists flexed their fins and went for it.